In 1923, the best African American jazz musicians, led by King Oliver and Clarence Williams, were finally given the chance to enter the recording studio. We can only speculate about what the music sounded like before this, but in 1923 it sounded perfect. Here was New Orleans jazz in all its glory, fully formed and realized. Joe “King” Oliver was one of the most renowned jazz trumpeters of the 1910s, but racial prejudices prevented him from recording at that time. In 1919 he moved from New Orleans to Chicago, and in 1922 he invited his former protégé, Louis Armstrong, to join him. 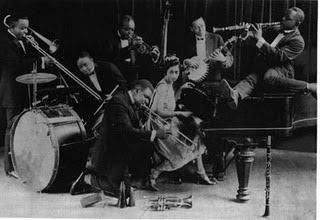 Oliver’s band, packed with some of the most talented jazz musicians of the day and in absolute peak form, was finally captured on record in 1923, and the results were nothing short of stunning. Recorded at their very first session, “Chimes Blues ” puts all previous jazz records to shame. The song opens with a dazzling yet graceful section of polyphonic jazz, with cornets, trombone and clarinet all staking out separate but complimentary melodies while the banjo, wood block and piano keep rhythm. The pace then slows considerably, although the instruments continue to chart separate melodic courses. Half way through the song, it changes again as the lead instruments now play staccato bursts with the rhythm section and the piano rises to carry the melody. Then, about two thirds of the way into the song, Louis Armstrong lets loose with a brief solo. 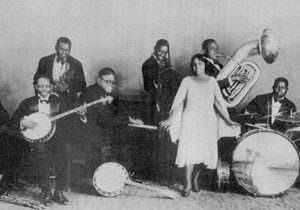 Up until this point, Armstrong had been forced to stand further away from the acoustic recording horn than his band mates, so that his powerful delivery would not overwhelm the other instruments. Listening to this solo, it is easy to understand why. Pay attention to this section, because it is a bit of foreshadowing: Armstrong is one of the all time geniuses of American music, and over the next few years he will almost single-handedly change everything. It is over way too soon, as Armstrong fades back into the ensemble and the song rolls to a nice easy finish. Clarence Williams was a talented pianist, songwriter, bandleader and businessman. He consistently made some of the best jazz records of the 1920s, thanks in large part to his great ear for talent (which landed him a position at Okeh Records) and a willingness to let the talented musicians around him stretch the boundaries. “Wild Cat Blues ” was one of his first big hits, and remains an absolute classic of New Orleans jazz. While the entire ensemble is in fine form, the record is primarily a showcase for the incomparable Sidney Bechet, whose amazing clarinet dominates from start to finish.